“If the stench of his wind was regrettable and intoxicating, it was nothing compared to the realisation that he couldn’t open any of the windows.” -image/caption submitted by Nicole S.
The outlook from this vast, modern space is utterly mystifying. The spellbinding scene set out is one that would keep one wanting to be awake and about, reaping in the beauty of one’s lush surroundings. 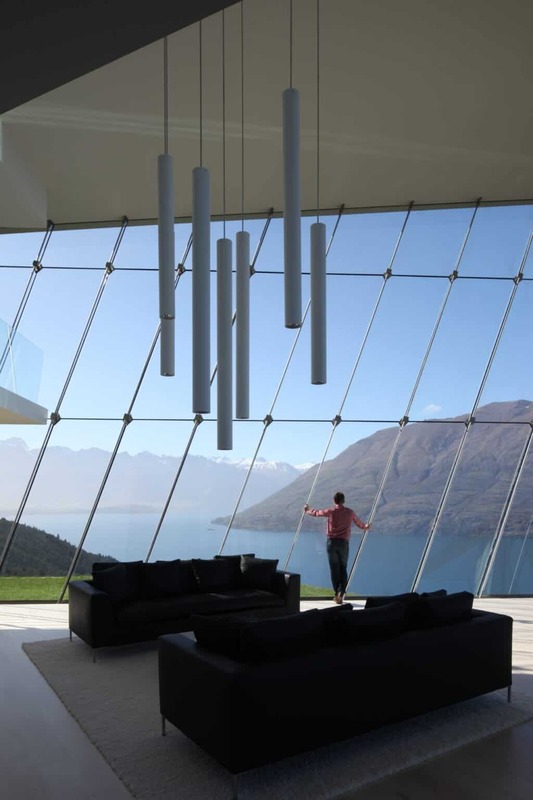 In a living space as large as the one seen above, it is no wonder that the designer went with wind chimes. The sound aside the tranquility of the scene out of your window blends the two into a picture of perfection, setting an atmosphere which is hard to describe. Large enough to be compared to the view out an airport window but warm and homely enough to call you right in, the living room above is a hipster’s dream come true. Divisions within a single large space is easier than one may think, given some tactful placement of key design elements. See how the sleek, black leather couches are placed central upon a square carpet in the same hue as the neutrals carried across this space. This creates a contrast which sets in place a definite living area while never straying away from the sense of open space which the room delivers. As if to break the linearity of the geometry used in this room, the diagonal motif works wonderfully, setting the space clearly ahead of any competition thanks to the modern twist it brings, and the perspective which it puts on the picture before you.